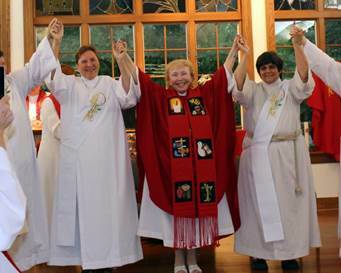 Kathie Ryan was ordained as Deacon in the Association of Roman Catholic Women Priests in Cincinnati on July 19 by Bishop Bridget Mary Meehan. Kathleen Ruth Ryan is married with the love of her life, Edward Ryan. Kathie is a mother of two sons, and grandmother of 5 grandchildren. For the first 15 years of her marriage, she worked at home raising her children. With the support and encouragement of her husband she returned to school in 1985 where she earned a degree in Spanish Education followed by a Masters in Social Work. Kathie taught in a parochial inner city school and worked with the poor at the local church food pantry for a brief time. The majority of her professional career was working at Parsons Child and Family Center with sexually abused children and their families. She retired after 15 years and opened a private practice where she currently sees clients who are suffering from depression and anxiety. Kathie has spend many years involved in church ministry as a lector, Eucharistic minister, parish council president, prayer and worship committee member, catechist and group leader in Formation for Ministry. Kathie knew there was so much more to ministry and was pulled and drawn by the Spirit until she was lead to the Inclusive Catholic Community of Albany. She is a member of this community’s leadership circle that is creating a sustainable, inclusive, evolutionary, and spiritual community. 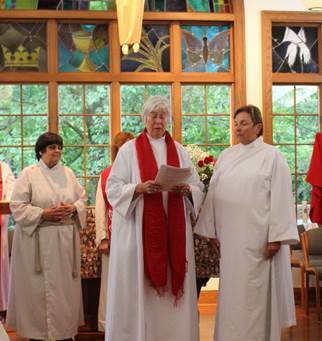 It is with great joy that I recommend Kathie for ordination.